The classic tonebender mki circuit is one that I long avoided tackling, but I have no idea why. This circuit rocks. It is primordial fuzz at it’s most glorious. 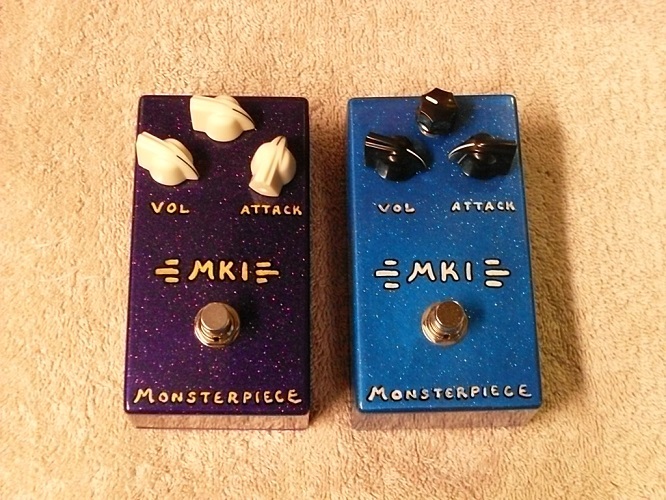 Sure, the maestro fuzz started it all, but the mki is the one that was chosen by guitar rock royalty over in England. Beck, Page, Ronson, Townshend… the list goes on and on. Well, here it is. The Monsterpiece MK I Fuzz. My take on this classic, hard to tame circuit. This pedal is right up there with the best of the best you are going to find based on this circuit. Nails the classic ’65 – ’66 era British fuzz tone that you know so well. This is not a subtle pedal. The fuzz is always full on in this circuit, and the attack control is essentially a transistor bias control allowing for a slightly gatey & sharp attack at minimum settings that transition to a more compressed and sustaining fuzz tone as you increase. I have also added another control that I like to refer to as the pedal’s “Third Eye”. This control sitting between the volume and attack knobs is an additional bias that works in conjunction with the attack knob allowing for maximum control over your fuzz tone. Endless variations of sweet, singing Germanium goodness lurk within! Volume controls the output level. Attack controls fuzz intensity. The “Third Eye” bias control in the center works in conjunction with the Attack control allowing for an almost endless variation of fuzz tones. The standard Monsterpiece MK I Fuzz can be powered by 9 volt battery only. I will also build with the LED indicator & adapter jack on request.